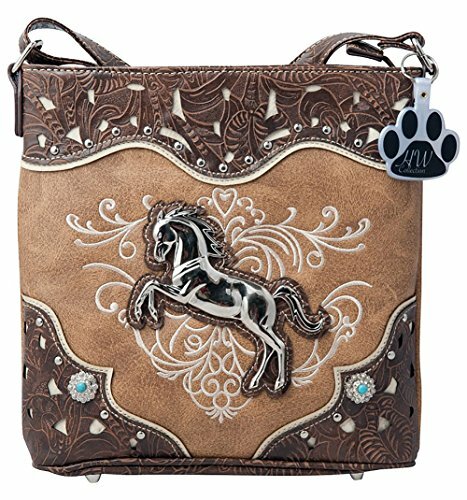 Western style crossbody bag messenger handbag is made from high quality premium faux/imitation PU leather decorated with silvertone studs, blue conchos, colorful embroidered designs, laser cut tooled pattern on top and on trim, decorated with silvertone horse, and detachable HW Collection key ring/purse charm on the front. Spacious with its single compartment fabric lined interior, front wall that has 2 open pouch pockets and a zippered wall pocket on inside rear. Secure your possessions with its zip top closure. One discreet carry concealed zippered pocket on the back (8 inches long X 7 inches tall) and an open pocket that can fit a 5 inch phone. Crossbody or over the shoulder adjustable strap. Suitable for work, shopping, vacations, evenings out with friends or just to stand out and show off your equestrian flair. 11 inches long X 10 inches tall X 3.25 inches wide.